Inking It Up With Cathy: Fast & Fabulous on Friday - Another Edition of "What's in the Box?" 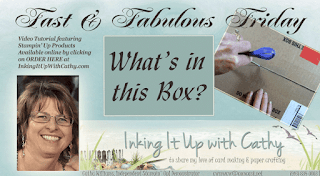 Fast & Fabulous on Friday - Another Edition of "What's in the Box?" Are you as excited as I am about playing with all the new products from Stampin' Up!? I am already having a great time creating projects with the new products and will be showing those to you over the next few weeks. However, in the interim, check out today's video of more of the new products from the annual catalog. This haul is much more than the last one I showed you and probably everything I will order until the holiday catalog comes out. After watching the video, scroll down further for more inspiration with a recent card I made. Happy Friday! This card was made using the Tuscan Vineyard stamp set and makes me think of the movie Under the Tuscan Sun. I attempted to color the home on this set in the same coloring as the home in the movie. The patterned paper at the bottom is a retired paper, however, the new Wood Textures Designer Series Paper Pack would work perfectly.